While We Need to Talk About Kevin only got buzz at the Golden Globes from Tilda Swinton's performance, the BAFTA's had much more love for the film about the mother of a teenage boy who went on a high-school killing spree who tries to deal with her grief and feelings of responsibility for her child's actions. We've already seen a couple trailers and one Rosemary's Baby inspired poster, but this one really amps things up, and even though I haven't seen the film, I've heard that it's quite misleading, if only because the film really isn't about the spawn of the devil like the aforementioned classic. See the new poster below! A suspenseful and psychologically gripping exploration into a parent (Tilda Swinton) dealing with her child doing the unthinkable. The mother of a teenage boy (Ezra Miller) who went on a high school killing spree, tries to cope with her overwhelming grief and the feelings of responsibility for her child's actions. 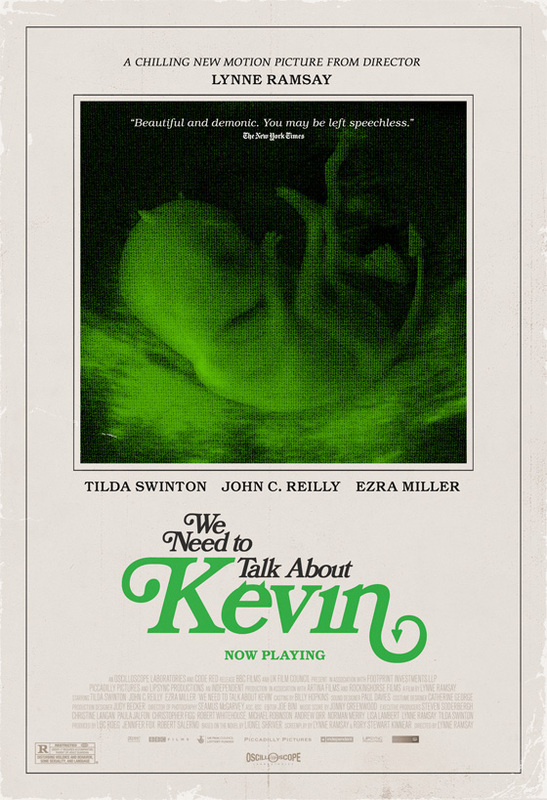 We Need to Talk About Kevin is the third film by BAFTA nominated Scottish filmmaker Lynne Ramsay, of the features Ratcatcher and Morvern Callar previously. The screenplay was co-written by Lynne Ramsay and Rory Kinnear, adapted from Lionel Shriver's 2003 novel of the same name. Oscilloscope Labs has the film in limited theaters right now. For more information on the film be sure to visit official website. Saw it at Telluride. Suspect it will bomb with US audiences outside of art circuit. It's basically ROSEMARY'S BABY meets ELEPHANT. Creepy, full of dread. i'm an american and i LOVED it. as for your comparsion - no, it's not RB meets elephant. we must have watched completely different movies with the same name. i do agree with your "creepy" and "full of dread" descriptions; however, i don't see how you get RB and elephant fromt that. i also don't think the movie was made to be a "blockbuster". i guess we all have our own opinions. i've seen the movie and that poster makes no sense.......horns and tail? it is a VERY misleading poster. BTW - don't miss this movie - it's excellent. very intense and disturbing. did i say it was NOT a metaphor.....i got that you idiot - it doesn't need to be said............what i didn't like is that as a POSTER REPRESENTING A MOVIE IT CAN MISLEAD PEOPLE TO THINK THE MOVIE IS SOMETHING OTHER THAN IT IS........ hope that isn't over your head. how am i NOT calm? the guy wasn't able to read my comment with any comprehension; so i restated it. i used caps on the part he obviously didn't read so he hopefully would see it the second time. as for your comment - it's spam........why not post something that's relevant next time? Relaaaax, take a deep breath. more spam............wow, the idiots the internet attracts....... don't you or the kid have anything to say about movies? I'll defo watch the movie. It didn't look as heavy in the trailer, but it sounds a bit mental.